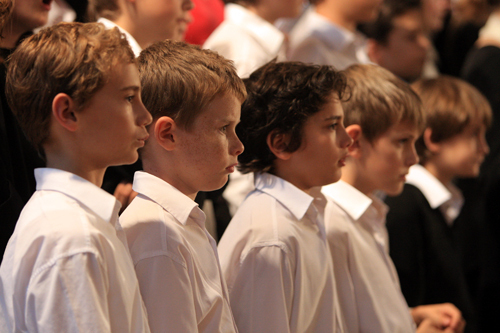 The eighty young singers of the Paris National Opera Children’s Choir present Maurice Ravel’s masterpiece L’Enfant et les sortilèges in a concert version as part of their Scottish Tour in July 2013. Just a few weeks before the grown-ups are on stage for the Summer Festivals, let’s meet the budding singers that could very much be the stars of tomorrow’s editions! L’enfant et les sortilèges is an operatic fantasia in two parts composed by Maurice Ravel in 1924, in collaboration with the author Colette. In his bedroom, a child rebels against his mother’s instructions. In a fit of anger he breaks everything on which he can lay his hands and then surveys the damage. Suddenly each broken toy, each vandalised piece of furniture and each maimed animal come to life to make it clear to him how selfish his behaviour has been. With its 470 singers aged 7 to 25, the Maîtrise des Hauts-de-seine / Paris National Opera Children’s Choir is the largest choir of his type in France. Every season, 80 of them become the ambassadors of French vocal music abroad and go on an international tour with a programme of concerts or opera recitals. Over the past 15 year, the Choir have performed in over thirty countries worldwide and in some of the most magnificent venues, including the Ancient theatre of Petra in Jordan and St. Peter’s Basilica in Rome. After Edinburgh, the Choir will also perform in Stirling’s Albert Halls on 23 July, Glasgow’s St Mary’s Cathedral on 24 July and Inverness’ Eden Court on 26 July. An event produced by the Institut français d’Ecosse.